Use what the professionals use - A high-quality, untreated patent bread flour milled from a select blend of domestic hard winter wheat. Tailored to the tradition of European milled flours, it provides the desired dough extensibility for hand stretching along with dough tolerance needed for fermentation and the hot, fast bake of the crust. In recent years, there has been a market trend toward Neapolitan-style pizza. Because this pizza has its roots in Italy, there are some who believe that Italian flour is needed to create the best Neapolitan-style pizza crust. Fortunately, this is not the case. The milling experts at General Mills have developed a new flour that meets the needs of this style of crust. Gold Medal® Neapolitan is a high-quality, untreated patent bread flour milled from a select blend of domestic hard winter wheat. 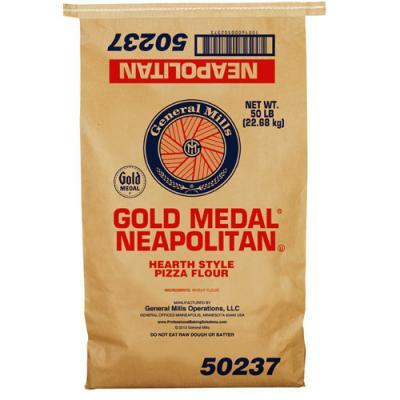 Tailored to the tradition of European milled flours, Gold Medal® Neapolitan provides the desired dough extensibility for hand stretching along with dough tolerance needed for fermentation and the hot, fast bake of the crust. Protein level 12.0%, maximum ash of 0.51%, Moisture 14.0%. Flour milled from a select blend of premium hard winter wheat - 100% domestically sourced. Ideal match for European-style flours Comparable to Italian Type 00. Tolerant to wood-fired ovens, perfect for Neapolitan crusts. Used for the best Neapolitan-style pizza crust, artisan breads and European bakery goods.